Ryan Giggs' first game as Wales coach got off to a flying start last night with a 6-0 demolition of China as Gareth Bale scored a hat-trick. Wales’ forward Gareth Bale scores against China during the opening match of the four-nation China Cup in Nanning, capital of south China’s Guangxi Zhuang Autonomous Region, last night. RYAN Giggs’ first game as Wales coach got off to a flying start last night with a 6-0 demolition of China as Gareth Bale scored a hat-trick. The Real Madrid forward scored his 29th international goal for his country to become the highest scoring Welsh player of all time, breaking Ian Rush’s record. 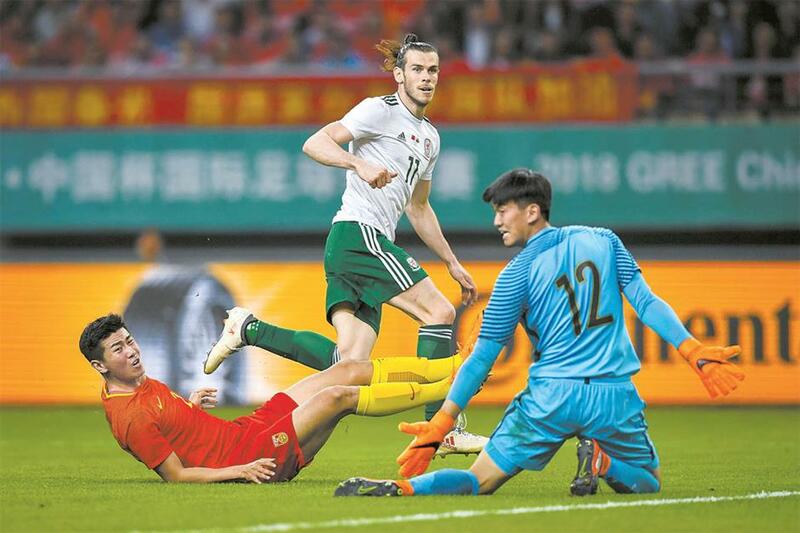 Wales wasted no time asserting its dominance when Bale held off China defender Wang Shencao to place a shot into top left corner of the net after just two minutes. It was one-way-traffic during a match between two teams which both failed to qualify for this summer’s World Cup in Russia. Bale almost got a second in the 17th minute as he chased a ball forward, but Shanghai SIPG goalkeeper Yan Junling sprinted off his line to clear the ball. It seemed a only matter of time before Wales scored again and in the 21st Sam Vokes capitalized on defensive sloppiness to put through Bale to score his second of the night. Wales continued to enjoy complete control and scored its third when Vokes flicked Andy King’s knockdown past the outstretched fingers of Yan into the goal. And just before half time Bale laid a pass into the path of Liverpool winger Harry Wilson who celebrated his 21st birthday by scoring his first international goal. China rang the changes with a raft of substitutions at half time but Wales came out unchanged after the interval and continued to dominate the hosts. Burnley striker Vokes grabbed his second in the 58th with a close range finish after Wilson had sprung the offside trap to put him through on goal. Bale sealed his hat-trick in the 62nd after latching on to a long ball forward. He was promptly substituted before the restart and left the pitch to rapturous applause from the Chinese fans in Nanning, south China’s Guangxi Zhuang Autonomous Regions. The four-team China Cup sees Czech Republic play Uruguay, tonight. The winner plays Wales in the final on Monday. Speaking after the match, China coach Marcelo Lippi said, “I don’t want to talk about the attack and defense today, I want to talk about the players attitude and performance.